Most of our Brass now has a PVD Finish! Physical Vapor Deposition coatings are extrememly thin, usually .05 microns thick. The process involves the deposition of zirconium nitride, titanium nitride, or other metallic ion combinations under low vacuum conditions. The PVD process provides a dense coating that resists wear and discoloration. No clear coat protection is required with a PVD finish. 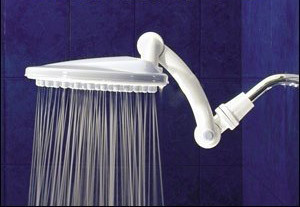 Build your own shower with our exclusive online point and click system!